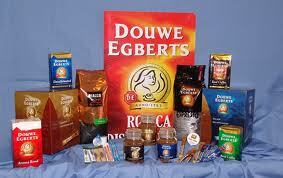 Douwe Egberts (often abbreviated as DE) is a Dutch corporation that processes and trades coffee, tea, and other groceries. Its full name is Douwe Egberts Koninklijke Tabaksfabriek-Koffiebranderijen-Theehandel NV, which translates as "Douwe Egberts Royal Tobacco Factory - Coffee Roasters - Tea Traders, Plc. ".